Choosing to complete a bachelor’s degree is not an easy decision. Considering the large personal investment that’s required, you may wonder about the ROI of a college degree in today’s job market. 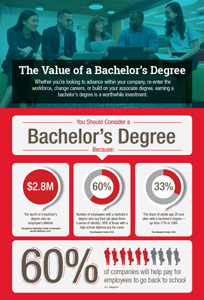 But whether you’re looking to advance within your company, re-enter the workforce, change careers, or build on your associate degree, earning a bachelor’s degree remains a worthwhile investment.